The 2017 UK Composites Show, held at the NEC as part of Advanced Engineering 2017, was very successful for us, and yielded some interesting new contacts, The actual proof of course will be revealed in the weeks and months to come, as we follow up enquiries and more detailed conversations take place, but first impressions are promising. We were pleased to unveil our new exhibition stand, which focussed on our key capabilities in machining and cutting. 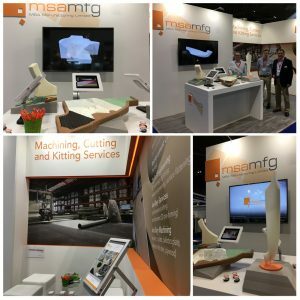 The stand included examples of some of the products we have manufactured for clients, with custom presentations detailing the process of manufacture and demonstrating MSA’s complete capability. It was also great to welcome many established contacts onto the stand, and to catch up with many of our clients on their stands. Click to see the LRQA ISO 14001:2015 | ISO 9001:2015 certificate of approval for MSA Manufacturing Ltd.